The Home Run Derby is a time where some of the best sluggers in the game get to show off their prowess and hope to be crowned king. Jesus Aguilar, Bryce Harper, Max Muncy, Alex Bregman, Kyle Schwarber, Javier Baez, Freddie Freeman and Rhys Hoskins all showed their chops, but it was Harper who earned the title as the 2018 Home Run Derby winner in his home stadium. To put everything into perspective, here are three takeaways from this year’s Home Run Derby. Fans booed Freddie Freeman and went wild less than five minutes later when Bryce Harper came up to bat. The Nationals outfielder defeated the Braves first baseman 13-12 with more than 20 seconds left in regular time. He faced off against Muncy in the semifinals, where he won 13-12 and was able to take a slight rest with some extra time on the clock. Against Kyle Schwarber he rallied hard, matching Schwarber’s 18 home runs in the last second. Luckily for Harper, he had 30 seconds of extra time, where he hit that elusive 19th home run. The crowd rallied behind Harper, hardly sitting down each time he was up to bat. 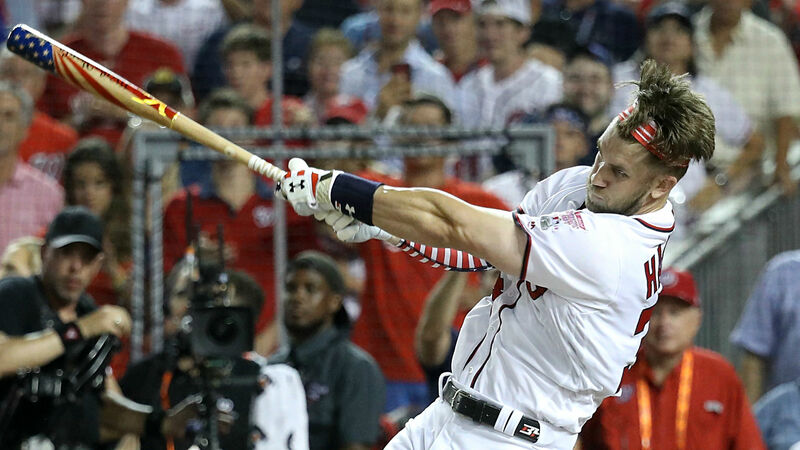 With the win, Harper became the first member of the Nationals to take home the Home Run Derby Crown. The Cubs outfielder hit a whopping 55 total homers, barely losing to Harper in the final. His 55 home runs are the second-most in Derby history, behind Giancarlo Stanton’s 61 in 2016. He started with 16 dingers in the first round, then matched Rhys Hoskins as the second player ever to hit more than 20 homers (21) in the semifinals. At more than 230 pounds, he was beastly throughout the entire affair. The Phillies first baseman, who is the eighth seed, stunned top-seeded Jesus Aguilar in the first round. Hoskins smashed 17 homers without bonus time, which dwarfed Aguilar’s 11. It’s impressive for Hoskins, who hit 14 homers in the first half of the regular season. For comparison, Aguilar leads the National League at the All-Star break with 24 home runs. [email protected] is moving on! His power didn’t let up in the second round, when he blasted 20 dingers. However, Schwarber gained momentum and hit 21 to push past Hoskins. Either way, he was technically the first player in Home Run Derby history to hit 20 homers in the semifinals.